The newest proposal from EIA showing how Hwy 19 would be rerouted to accommodate the third runway. On March 19th, the conference room at the Nisku Inn was standing room only with people lining the back walls three deep to listen in and be a part of the discussion between the Edmonton International Airport, Alberta Transportation and the public at large affected by the twinning of Hwy 19. 327 people were registered attenders but there appeared to be many more in the room. There was a heavy political presence in the room with representatives from Leduc County, the Town of Devon, Leduc City, MLA's McQueen and Rogers, the Assistant Deputy Minister of Transportation Andre Corbould, AB Transportation Minister Ric McIver, and even the former Minister of Transportation Ray Danyluk, to name just a few. Mr. Reg Milley, the CEO of EIA was also present. Of everyone noted, the only person who chose to approach the microphone, speak directly to the public and attempt to answer questions was Minister Ric McIver. Even when their actions were drawn into question and opinions sought, other political representatives mentioned by name throughout the evening and who were present in the crowd, chose to remain mum. The outside of the room was surrounded with large maps showing various routes that had been proposed for the Hwy 19 twinning project, as well as letters from residents and former Minister Danyluk, artist's representations of flight levels, and the layouts of other airports around the world. Sticky notes were available to anyone who wished to write a comment or suggestion directly related to a specific spot on the maps, and people were encouraged throughout the evening to write their ideas or concerns on a note and place it on one of the maps beside the area they were discussing, or to fill out one of the comment forms that were available. The evening began with moderator Jaqueline Shimpf explaining how the evening would progress, with a panel of experts at the front giving their presentations on the current situation to begin, and then the floor would be opened up for questions from the public. The panel, consisting of Asst. Deputy Minister of Transportation Andre Corbould, VP of Airport Operations for Edmonton International Airport Diane Trenn, and ISL Consultants Land Services Manager of Highway Design and Construction Roy Biller, were introduced by MLA Rogers. MLA Rogers opened with comments of how he wanted to see Hwy 19 twinned for both safety factors and the freer flow of commerce. He also stated that tonight was an opportunity for everyone to share information, as opposed to simply being "told" something. Asst. Minister Corbould was the first speaker invited to the microphone and he spoke of how the twinning of Hwy 19 was not a stand alone project but rather just a part of the Greater Capital Region Transportation Master Plan. He claimed that conversations had already begun with land owners and churches directly impacted by the realignment despite the fact that this project is not yet on the three year plan. He closed his statements by saying that it is not a matter of if, but rather when the twinning will happen, and how this time prior to the start of the project needs to be used for planning. Ms. Diane Trenn said she recognized the airport as both a "great and challenging neighbour", but with the forecast for EIA to handle over 7 million passengers this year the airport must continue to grow. She said that a comment that is often heard in regard to the expansion of EIA is how Heathrow handles millions more passengers on just two runways but she pointed out that Heathrow was limited to accepting only large aircraft, and that Edmonton was unique in that it handles aircraft of all sizes. She also commented on how other considerations such as prevailing winds, environmental restraints, and landscape tie into the design requirements for a third runway. Diane stated that a draft timeline for the project is that land acquisition would begin in 2015, a detailed design in 2016, and the runway would be completed and functioning in 2025. She stated that the reason land acquisition was not happening at this moment was due to the fact that the airport simply does not have the money to do so right now. Mr. Roy Biller said that functional planning of the realignment began prior to the year 2000 with the first plan being released in 2000, at which time they had been informed by EIA that a third runway would not be required for another 35 years, so the plan was to place the twinning of Hwy 19 along the existing route. Then in 2005 another study was done and a new functional plan began in 2006. In 2007 the airport experienced a large jump in usage so in 2008 EIA came back and expressed a need for a third runway by 2025. Mr. Biller said that several options were looked at and discarded in regard to rerouting Highway 19. 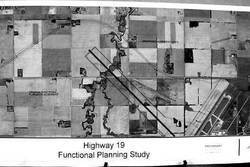 These even included discussions of running the twinned highway underneath the runway but those ideas had to be discarded as Hwy 19 is a high load corridor and those plans would have tripled the cost of the project. He did point out that the newest alignment being presented this night did completely avoid St. John's Church and their cemetery, whereas a previous plan had the highway running right between the church and their cemetery, but it does leave historic St. Mary's church directly underneath the flight path of departing planes. In closing, Mr. Biller said that they would be taking all the suggestions presented at this meeting and put together a fourth plan to be brought back in the fall of this year at another public meeting. A community representative, Mr. Curt Makepeace was then brought onto the podium and allowed to present the community's point of view on the process. Mr. Makepeace began by questioning as to how many more of his friends and neighbours had to die on Hwy 19 before the government would stop bowing to the desires of EIA and twin the hwy? He informed the crowd that Hwy 19 was one of the top 3 busiest single lane highways in the province but it was still not on the three year plan. He questions why this is. With the twinning plans originally set thirteen years ago the only reason he sees for the delays are due to the airport's wants. He accused Alberta Transportation of allowing the desires of a private corporation to determine the placement of a highway. He then called former area resident Mr. Don Dublanko up to the microphone to read a letter he had written. Mr. Dublanko spoke of how his father had already lost their family's farm and their future to the airport 57 years ago, the last time the airport expressed a need for more land, expanded, and forcibly took their land. He spoke of how, to this day, that land still lies unused, outside of the airport fence line. He ended his letter with the exhortation for EIA to build on the land they already have, which brought a round of applause from the audience. Mr. Makepeace went on to say that repeated attempts to speak with the airport authorities and Alberta Transportation had been either ignored or rebuffed, and it had been made plain to residents that EIA was unwilling to look at other options. Even with support to keep the realignment of Hwy 19 along it's original route coming from Leduc County, MLA's McQueen and Rogers, and former Minister Danyluk the actual work of twinning the highway kept being delayed by plans coming from EIA for a third runway. Mr. Makepeace ended his presentation by stating "I guess they can do what they want on the land they expropriated 57 years ago, but if they want more they will have to publicly explain why!" The floor was opened for questions from the public at that time, which was obviously what the vast majority of the audience had been waiting for. Arms flew up throughout the crowd and for the next hour and a half most people waited their turn to speak and were respectful of the responders and their answers, but at one point, as the crowd's frustration with the answers they were receiving was growing, one gentleman stood up and loudly exclaimed "Everyone is here for the same reason! Would everyone stand up that wants the highway twinned on the same path it is currently on? Lets send a message to the Minister who is now in the building!" To which the entire audience came to it's feet and burst into a loud round of sustained applause. Immediately following this outburst the next question directed at Minister McIver was; "Are we just wasting our time here? The airport does not seem interested in any other options." Which was a completely valid question as just prior to this, another representative from EIA had stated unequivocally that the airport simply could not place the third runway on the property they already have. Repeating the statement that "It could not be done." Minister McIver responded that he certainly hoped everyone wasn't wasting their time since he could think of more pleasant ways to spend an evening, as he was sure everyone else could too. He thanked everyone for taking the time to come out tonight and express their opinions and share their ideas. He stated "I need to see and hear you as this is important to me." He also commented that he was seeing a lot of unhappy faces in the crowd tonight so he acknowledged that they (the Ministry) still had a lot of work to do. When the evening drew to a close a local lady by the name of Rose approached Minister McIver. She handed her comment card directly to him with the statement that she wanted him to read it and then he could "direct it to wherever he needed to." When asked his view of how the evening went, Leduc County Mayor John Whaley replied that "If you make the people happy, you make the County happy. Don't hold off any longer and twin the highway on it's present alignment. If I was the airport I would go back and seriously consider other options." Devon's Mayor Anita Fisher stated that "We need to find ways to keep our economic drivers strong and the airport is one of those drivers, but I just want it figured out and to get it on the three year plan. This conversation has gone on way too long. It's a little highway but it's a personal highway. Everyone has a stake in it." For those who were not able to be present for this open house but are interested in more detailed coverage of the questions that were asked, Alberta Transportation said that they were recording the entire evening and would be posting a Q & A document onto their website that would quote the discussions held at this meeting, as well as addressing the questions raised on the comment forms.